Day 6 of my Sans-Snacky fast. Yesterday, my husband was cleaning out our heinously unorganized garage and came across the long lost bag of Chuck E. Cheese coins (not sure if these are everywhere, but it’s basically a pizza place with tonsssss of kid electronic games and a playground all hosted by a huge mouse/rat guy named Chuck E. Cheese). My oldest son loves the place and was ecstatic! And, of course, there was no discussion (in his mind) as to when we were going. It had to be that night. Well, Chuck E. Cheese has pizza there for about a zillion bucks a pop, and we are… well, you might remember that we are on a budget to help fund my husband’s product, Chord Dice. So I made a deal with my 5-year old that we’d go to Target and get a frozen cheese pizza. 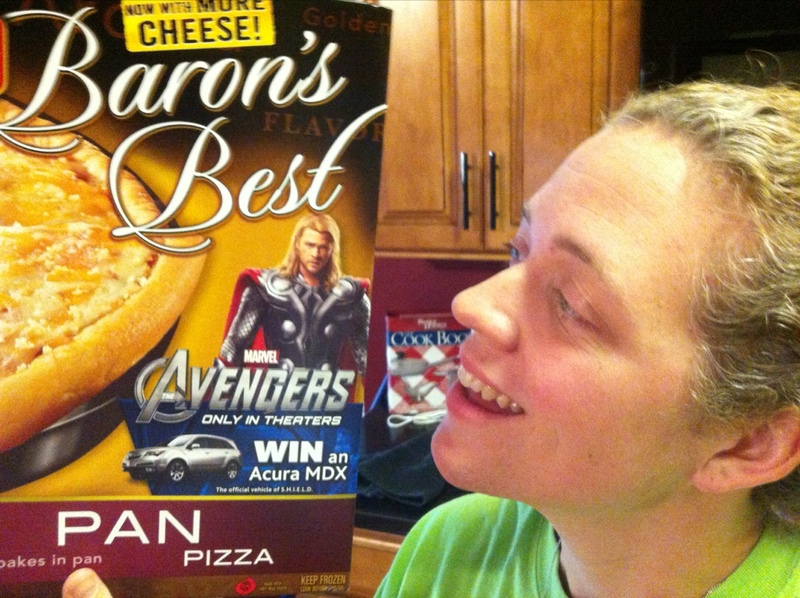 And he picked… the Thor Red Baron four cheese pan pizza… again. It’s like day 166 all over again! In my mind it was not going to be a problem. I had already made my husband and I a delicious dinner of Caribbean Black Beans (yum.may.) and so I wouldn’t need any more dinner. Yeahhhhhhhhhh, note the words “in my mind”. Cause in reality, I had two slices. That dern Thor Red Baron four cheese pizza. And ya know what I noticed? I wanted to keep eating it because I wanted to keep experiencing that flavor. The flavor of the bread and the spices in the tomato sauce and the cheese. I wanted all of that to continue. I think I wanted a little escape actually. I’m feeling a bit “off” at present. I adore my husband and I love him being home, but it has made me realize that I’m gonna have to readjust my schedule to find some alone time… and when I don’t get my alone time it starts to wear on me. I’ve always been that way. And so, I guess the pizza… oh. wait. I’m sorry… the Thor Red Baron four cheese deep dish pan pizza was like an old way of escaping. And once again I felt bad last night after the fact. And once again this morning I knew I should feel bad about it (yes, even while I was scheming in my mind as to how I was gonna get my hands on my son’s leftover pizza crusts from last night) but I was just ready to move on. And I felt like I should feel bad for just moving on. Kind of a cool thought to think that’s how God looks at my fear and inadequacy. It’s of no consequence to Him other than it’s getting in the way of His Miracles. So, in that case… Onward!! !